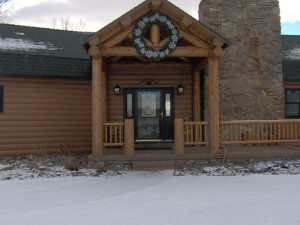 Log siding from ABC Seamless gives homes in Albuquerque, New Mexico, and all surrounding communities, the rustic look of a log cabin, without the headache that comes from having to maintain actual wood logs. We engineer our siding out of 28-gauge, G-90, hot-dipped galvanized steel that provides the appealing look of wood without the problems that comes with it – problems like cracks, insect infestation, wood rot, and other worrisome issues that can require expensive repairs. In fact, you’ll never have to worry about maintaining this log siding, because it will never need to be scraped, painted, or stained. Increased energy efficiency – We install our steel siding over foam-backed forms and insulation to support each log. This layer of thermal protection will help keep your home more comfortable year after year. Customization options – You can choose from a large selection of colors, including two-tone, high-definition, and woodgrain to make your home uniquely yours. What’s more, we never discontinue a style or color, which means that if you ever build an addition onto your home, your siding color will be available for a truly seamless match. Incredible warranties – We back our siding with a lifetime, non-prorated, transferable warranty, so you can rest easy knowing your investment is well protected. For more information about the beautiful log siding that can enhance your home’s appearance in Albuquerque, NM, contact ABC Seamless of Albuquerque today. They did a great job on our project. Sal worked with me to come up with the best design for a tricky area. Ordered the materials and set a date to install. Came when they said they would and did a great job. Very professional. Great. Evaluation was done shortly after I telephoned, did not take long to schedule the work, work performed quickly, accurately, completely, and the new sections of gutter matched exactly to the older portions. The workers were good, they cleaned up and they did everything that they said they would do, and we haven’t had problems since. They cleaned up like nobody had been there. We have had a continual problem with our roof leaking, and they were they first ones to figure out that we had a problem with our downspouts. They solved a longstanding problem. How Will Gutter Guards Protect my Home’s Gutter System? Is Seamless Siding the Right Choice for My Home in Tijeras, NM, or a Surrounding Area? Will my New Patio Cover in Albuquerque, NM, or a Surrounding area be Maintenance Free? Will New House Siding Enhance the Durability of my Home in Edgewood? Is Metal Siding the Right Choice for my Home?